Well, it's official -- I wrote a cookbook and we had a launch party to celebrate. I remember when I signed the contract with the Wisconsin Historical Society Press in 2014, the release date seemed a lifetime away but it turns out, 2017 was just the right amount of time I needed to write the book and then plan the party. In true Mary Dougherty fashion, my initial plans for the launch were ambitious and border-line extravagant -- a whole hog on a spit with all sorts of sauces and sides. But somewhere along the way, my plans started to come into line with what I could reasonably pull off -- and 100-plus pounds of pork over an open flame wasn't in the cards. What was in the cards was George on stage, two beef briskets smoked by an actual Texan named Angela, a pile of cheddar chipotle grits, a bunch of tequila, and a theater and house full of some of my favorite people. It all went off without a hitch except for George. George went rogue and as Jack said, it was a code red kind of situation. 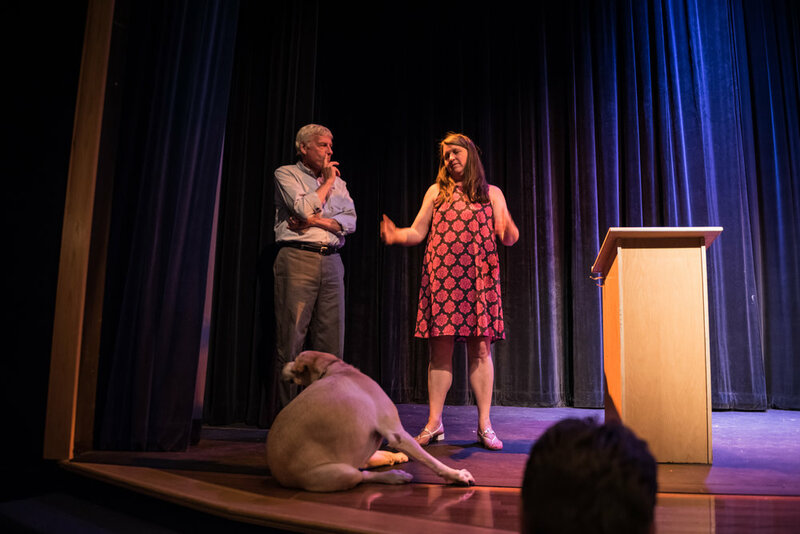 I had a plan -- I would read the cookbook from stage with a handsome and sedate George lying at my feet. However, George had other plans and completely lost his yellow Lab/food-addled mind. He wanted to eat the food I made for the party and in true Lab fashion, he single-mindedly pursued that goal. 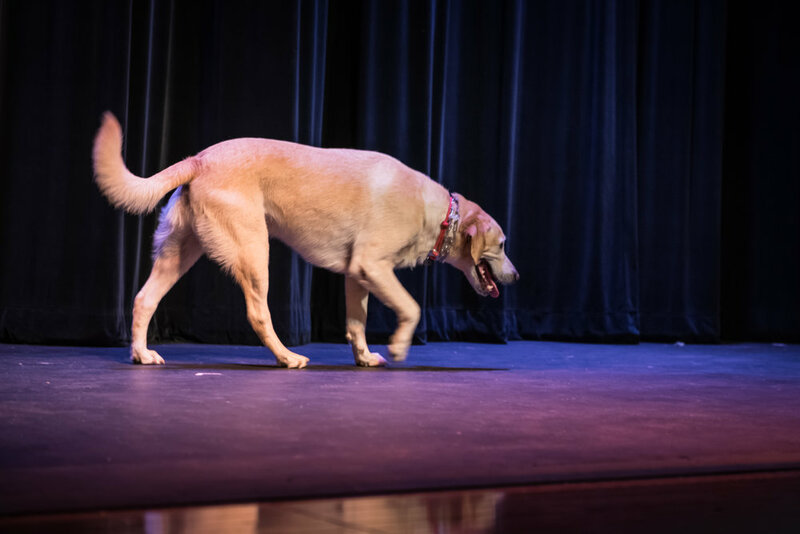 By the time we took the stage, he was wound up and refused to be calm, cool, and collected. 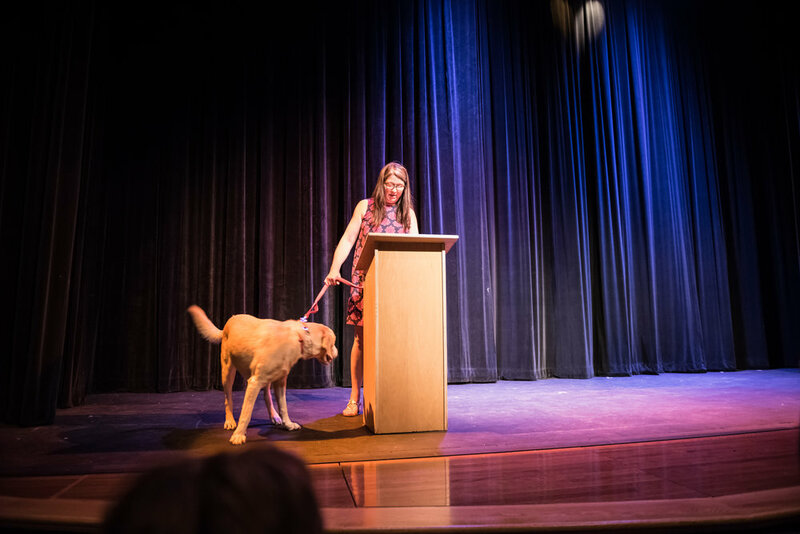 So we took his leash off, gave him free range of the theater, and proceeded as if it's entirely normal to have a free range Lab at a book launch party. And truthfully, it was perfectly normal -- he is a Dougherty dog after all. It was a truly lovely event -- I was humbled and so touched by everyone who came to help launch Life in a Northern Town into the world. While my name is on the cover, the book actually has multiple co-authors and many of them were in the crowd that afternoon. The Bayfield area community welcomed us all those years ago and shared their experiences, their stories, and their homes with us. The Bayfield we know and love is a direct result of the generosity of the people who call our northern town on Lake Superior home. The night ended with a couple of briskets smoked to perfection, a pile of white buns, pots of Texas baked beans and chipotle grits, and enough tequila to get everything moving in the right direction. And it was perfect -- our kitchen was full of everything I truly love -- good food, good booze and the best people. Do you want a signed and/or personalized copy of Life in a Northern Town? They are available on my website here and I'd be happy to sign one and drop it in the mail for you! ps -- Wil Dougherty, long-time photo safari companion and talented photographer, took all these photos!